Niagara Falls straddles the international U.S./Canadian border, offering visitors on both sides beautiful vistas, boat rides and more. It's located about 17 miles from Buffalo, NY and about a seven-hour drive from New York City. It's ambitious to travel to and from Niagara Falls from New York City in a single day, but it can certainly be done. You can choose to visit as part of a tour group or make the trip on your own. You might also want to spend a night in Niagara Falls before returning to New York City, the choice is yours! If you want to visit Niagara Falls on your own, you can choose to go by car, bus, train, or plane. By Car: Depending on your level of adventure and tolerance for long car rides, you might choose to rent a car in New York City and make the nearly 400 miles drive up to Niagara Falls. If traffic cooperates (the earlier you leave New York City, the better) you can make the trip in about 7-7.5 hours. By Train: Amtrak service to Niagara Falls from New York City takes about 9.5 hours. 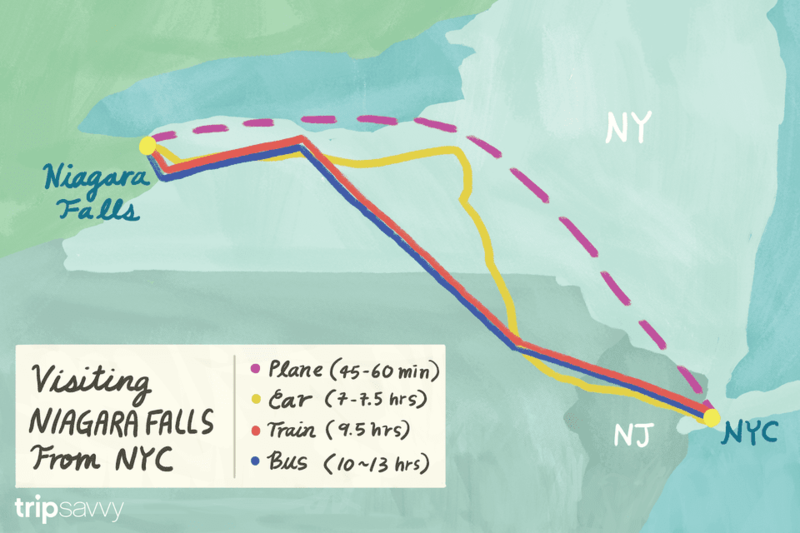 By Bus: It takes 9-11 hours to take the bus from New York City to Niagara Falls. By Plane: Flights to Buffalo, NY & Toronto, Ontario (Canada) take only 45-60 minutes, but travel time is a bit longer once you factor in time getting to/from airports, clearing security, etc. It's still the fastest way to travel and should take 3-4 hours each way. These companies offer one-day tours from New York City to Niagara Falls, with travel by air. Tours visit both American and Canadian sides of Niagara Falls, so you'll need a passport (& visa if applicable). Niagara Falls Trips from Tours4Fun: Choices include 2-3 day trips to Niagara Falls from New York City, including options for shopping, seeing the Thousand Islands, Corning Glass Center, Philadelphia, and Washington, DC. Two Day Trip to Niagara Falls from Viator: Bus transportation and overnight accommodations, as well as tours, included. Top 10 Niagara Falls Attractions: On the Canadian side of the falls, you'll find lots of entertainment, including The Maid of the Mist boat ride that gets you right up close to the action. If you plan an extended trip to Niagara Falls from New York City, you might like to visit some other area attractions, including Niagara-on-the-Lake, the Shaw Festival or even head to Toronto, Ontario to experience a great Canadian city. The Niagara Wine region is also easily accessible from the area near the falls, so it's easy to plan a full vacation in the area.